manages Android, iOS, Linux, macOS and Windows devices, throughout their entire lifecycle, from deployment to retirement. It controls all aspects of business mobility and IoT — tracking physical assets, managing applications and content, remotely supporting devices, as well as keeping devices and data safe and secure. SOTI has a proven track record for managing rugged, special-purpose and IoT devices used in key industries, such as: healthcare, transportation, logistics, retail and field services. It removes the complexity from managing a multi-OS, multi-vendor and multi-purpose business mobility program. SOTI MobiControl supports Android, iOS, Linux, macOS and Windows devices from over 150 device manufacturers, giving organizations the freedom to choose the devices that best meet their cost, operating system, form factor and security requirements. 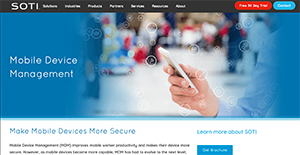 Get mobile devices into the hands of workers faster, and make sure they are setup according to company mobility policies through integration with device OEM rapid enrollment solutions, such as Apple DEP, Android O zero-touch enrollment, Samsung KME, Windows Autopilot and Zebra StageNow. Use integrated productivity tools and remote support features that reduce worker downtime and keeps them focused on their work. Remote support features such as remote view / remote control, file synch, and 2-way chat, fix device and application problems quickly. Companies can employ a complete suite of mobile content and application management tools to empower their workers. Organization can use SOTI Hub, SOTI’s content management solution, to secure access to company files on the device, regardless if the files are located in the cloud or within the company’s network. And, they can use SOTI Surf, SOTI’s secure browsing solution, for securing access to intranet sites and for blocking access to unapproved websites. Since each enterprise has unique business wants, it is prudent for them to refrain from seeking a one-size-fits-all faultless software solution. Needless to say, it would be futile to try to find such an app even among popular software applications. The intelligent thing to do would be to jot down the various essential factors that need consideration such as main features, budget, skill levels of employees, company size etc. Then, you should do your research thoroughly. Read some SOTI MobiControl reviews and check out each of the other solutions in your shortlist in detail. Such in-depth homework can ensure you weed out ill-fitting platforms and zero in on the solution that presents all the features you need for business success. How Much Does SOTI MobiControl Cost? We realize that when you make a decision to buy IT Management Software it’s important not only to see how experts evaluate it in their reviews, but also to find out if the real people and companies that buy it are actually satisfied with the product. That’s why we’ve created our behavior-based Customer Satisfaction Algorithm™ that gathers customer reviews, comments and SOTI MobiControl reviews across a wide range of social media sites. The data is then presented in an easy to digest form showing how many people had positive and negative experience with SOTI MobiControl. With that information at hand you should be equipped to make an informed buying decision that you won’t regret. What are SOTI MobiControl pricing details? What integrations are available for SOTI MobiControl?